Get ready for Halloween with The Coolest Halloween Healthy Fun Food Hacks. 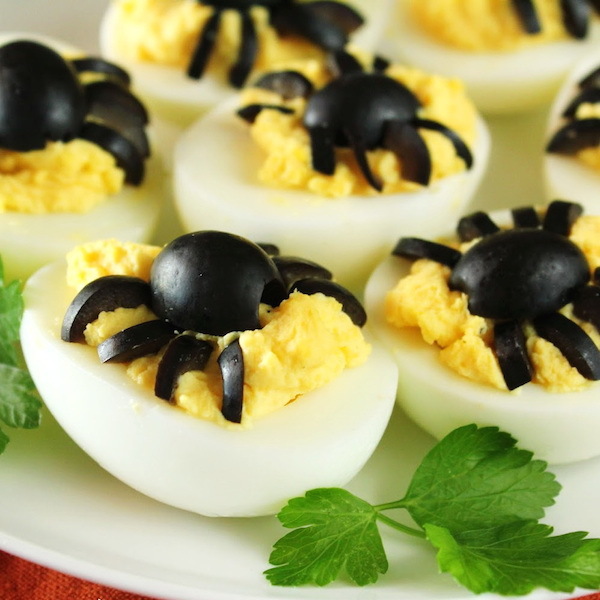 From spider deviled eggs, veggie skeletons, to banana ghosts and pumpkin burgers, you will love all these crazy fun ideas that are super easy to make. Halloween doesn’t have to be only about eating candy. You can also make healthy fun food for everyone to enjoy. Have fun this Halloween with these seven fun food ideas to choose from. They are all super easy to make and could also be fun activities on Halloween. The banana ghosts and tangerine pumpkins are always a hit. I made them once for my kids’ preschool and everyone loved them. It also made me feel so good I was offering fruits instead of candy. The kids are going to get plenty of candy when they go trick or treating anyway, so what a great idea this was to share it at a school party. This Halloween food hacks for kids and adults are really super cool. Have a healthy Halloween with lots of fun activities and creative fun food. Give these ideas a try and see how easy they are to make. Fresh ingredients, fruits, veggies, and a little creativity is all it takes. 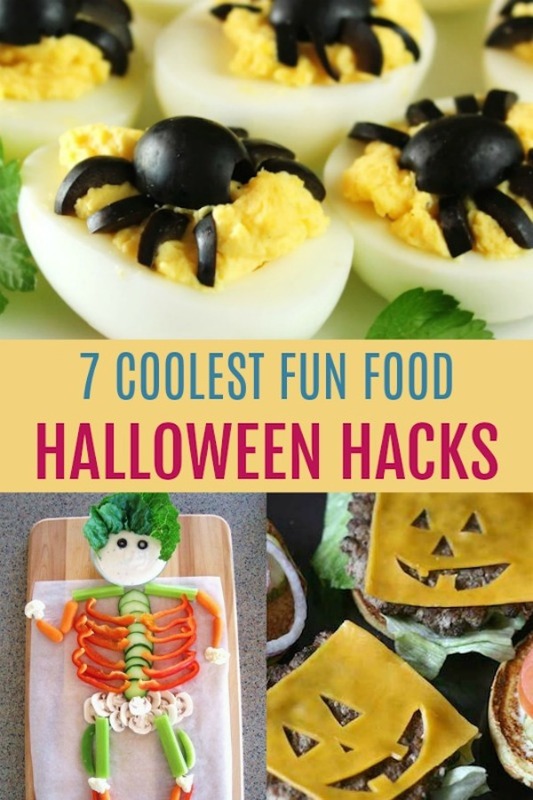 Whether you are having a party at home or going to a school event, these super cool Halloween food hacks are just perfect finger foods everyone will be crazy about. The best part is they are all healthy options and the kids will be super excited about them. Great Halloween healthy fun food hacks. Instead of candy, make a big fruit tray. Kids LOVE this idea and it is super easy to make. You can add a few drops of lemon juice to prevent the bananas from turning brown. Perfect finger food for a Halloween party. 2. What about scary burgers with faces cut out of cheese? So creative, easy and perfect for a Halloween party! 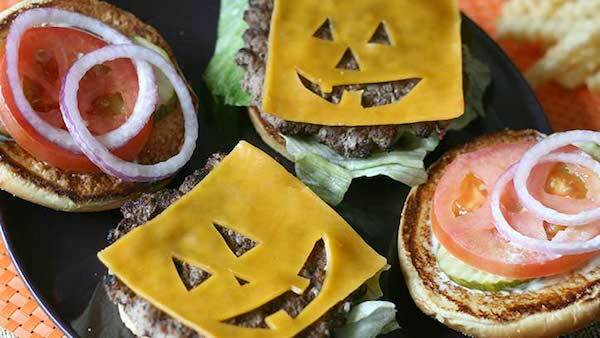 Everyone will just love these spooky cheese burgers. The best part is you only need to make the scary faces with a slice of cheese. Easy breezy! 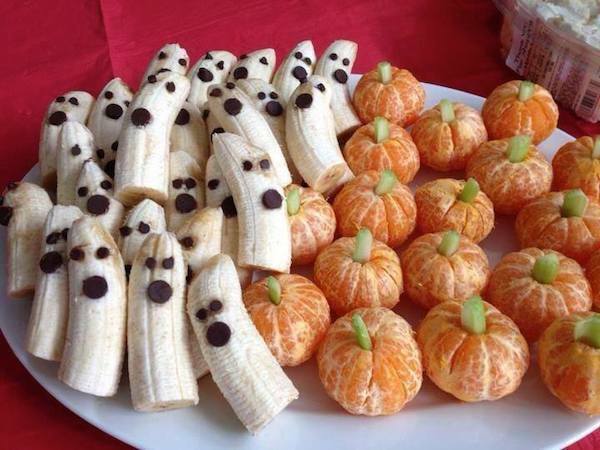 Decorate your Halloween party table with this super healthy fun food idea. A scary salad that kids might actually get to try. 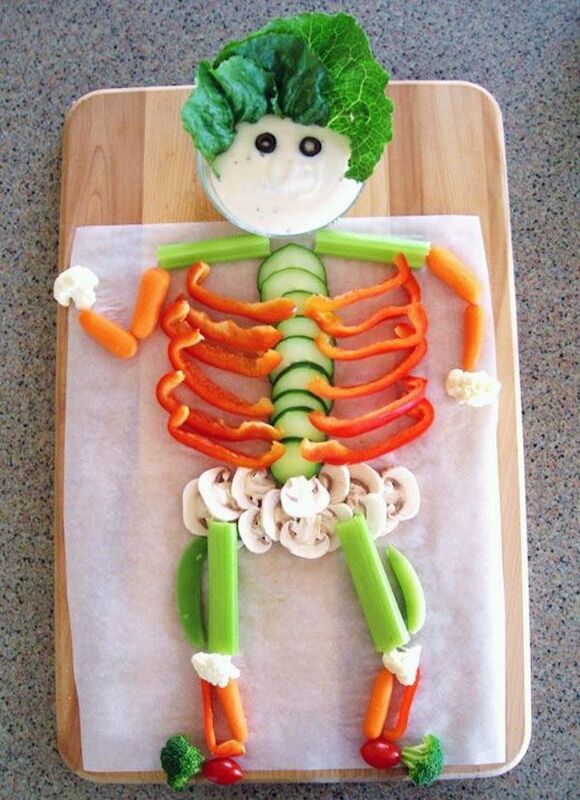 This is the healthiest skeleton ever! A fantastic platter for a party and a great finger food for kids. You just need olives, eggs and some mayonnaise. Everyone will love them and they will look so pretty at the table. Use your favorite nut butter and seeds. Aren’t these monsters just adorable? Perfect to serve at a party or a fun snack. This is a super cute idea from Fork & Beans. This monster will totally decorate your Halloween table. 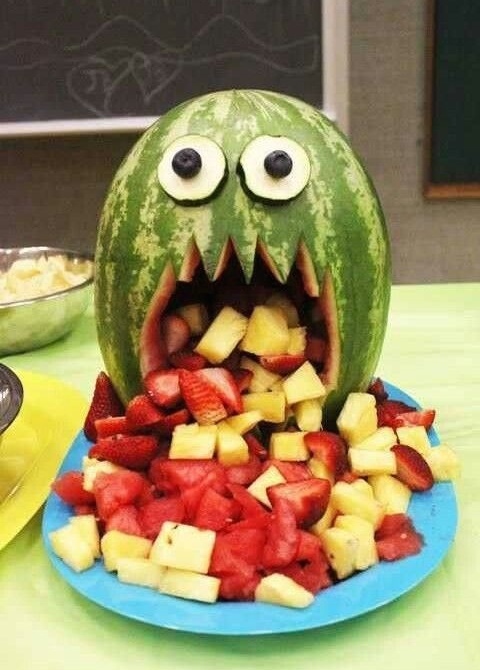 Make a delicious and healthy fruit salad and make a monster face with a watermelon. 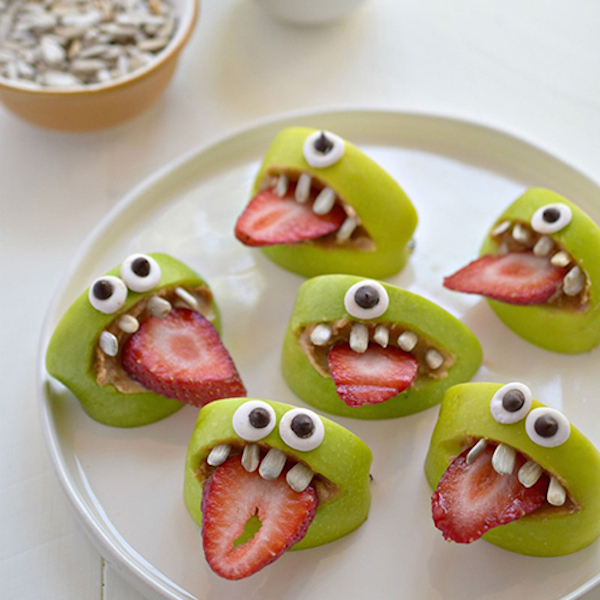 I think this is a super clever healthy option instead of serving candy. Impress your guest and make them laugh with this Halloween food hack. so simple! 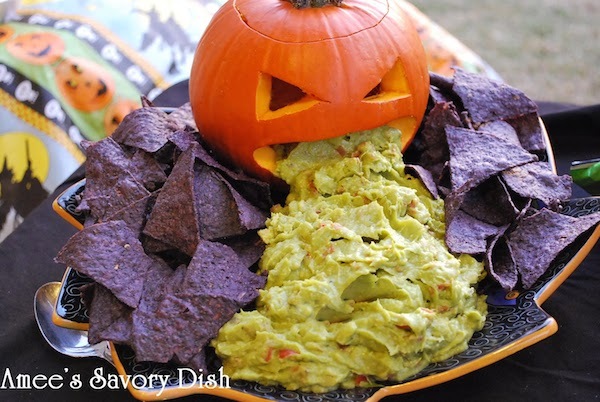 Just have guacamole come out of your pumpkin. I know, it is kind of gross if you think about it, but Halloween is about scary stuff anyway. Idea from Amee’s Savory Dish. If you are interested in reading more about my blog, please take a look at my latest articles. I am a mom blogger who loves to share creative and healthy fun food ideas. You will also find lots of DIYs, hacks, and lots of tips for living a healthy family lifestyle. Kids deserve to eat real food. If you are interested, please check out my recipes for easy to make, healthy, and homemade family meals. I am not a chef or have many years of experience cooking, so most of my recipes are very easy to prepare. These ideas are adorable. I definitely need to make some! !